We arrived in the evening after taking the morning bus from Hiroshima all the way to Osaka and then going to Kyoto. 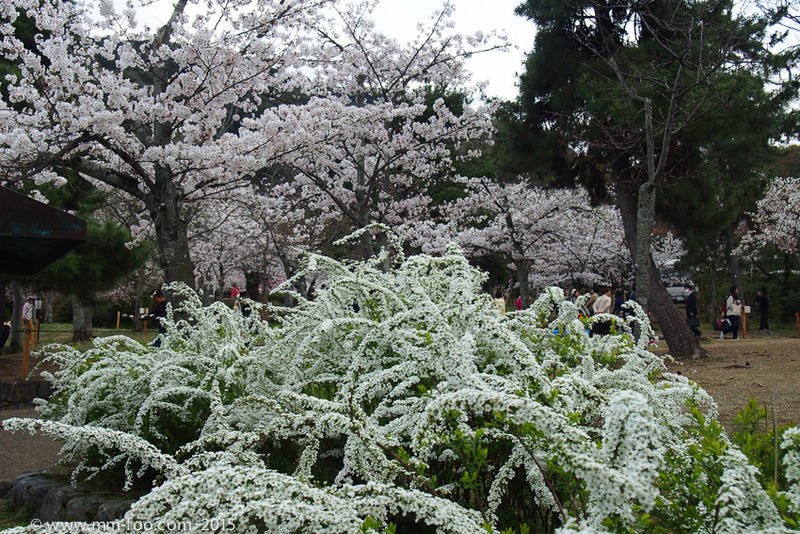 And we were greeted with lots of sakura lining the streets and canals~ Pretty!! 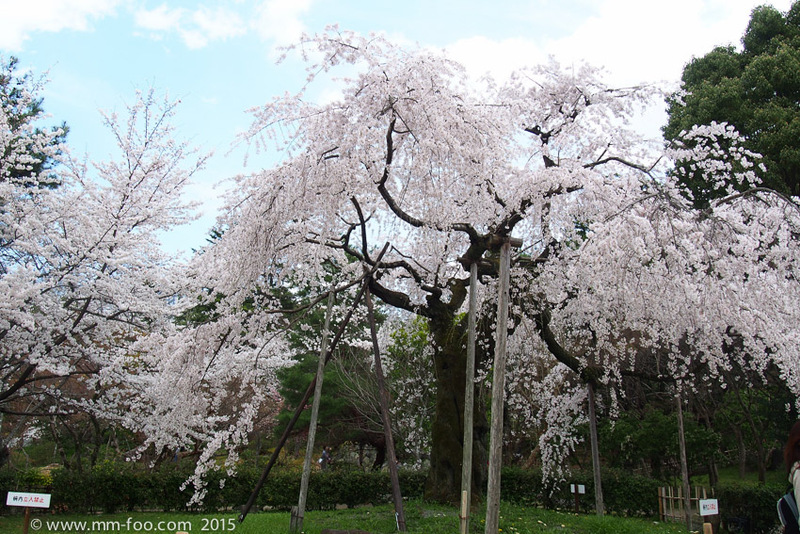 On our previous trip to Japan back in 2012, we cycled past Maruyama park and we were told that there's a big sakura willow there so on this trip, we made it a point to go back to check it out. 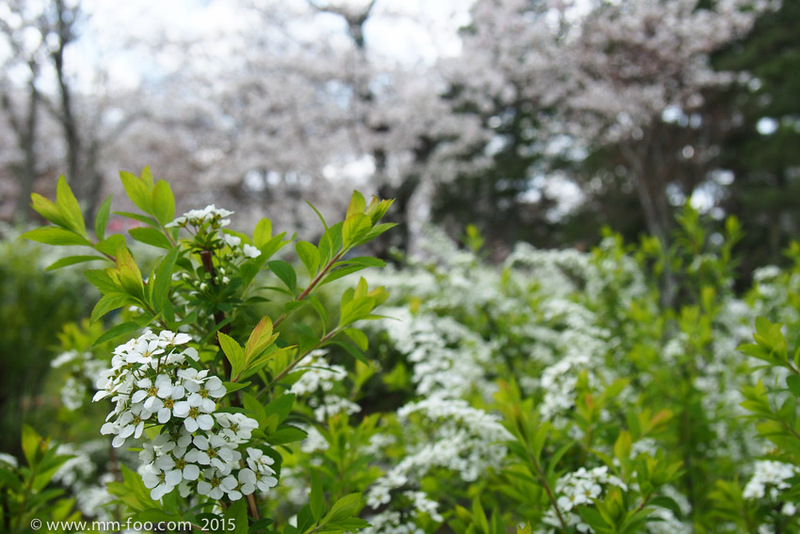 Food stalls with outdoor seating so that you can enjoy some hanami aka flower viewing. Some people even had mats on the ground! We found the centrepiece! Here, MF is just chatting up to the old ladies hanami-ing. I think the tree looks quite spectacular with the willowy branches and flowers all over the it. MF decided to get a picture with the ladies too ^^v. We met this man with his dog and when we asked for a picture of the dog, he just thrust out the dog to us. LOL! After Maruyama park, we decided to cycle our bikes along the Philosopher's path because I thought there probably would be nice sakura along the path. On our way there, we also saw lots of sakura lining the sides of the river. Got onto the path and there were soooo many people! We had to dismount and push the bikes. FYI, if ever you go to Kyoto, rent bicycles! They're not expensive (our hostel rented theirs to us for 500 yen/day) and it's a nice way to explore and discover the city. You also don't have to match your schedule to bus times and find bus stops! Plus it brings you straight to your destination! With buses/trains you still would need to walk to the place anyway. Having maps make things easy. This map shows a lot of the temples and shrines around Kyoto. 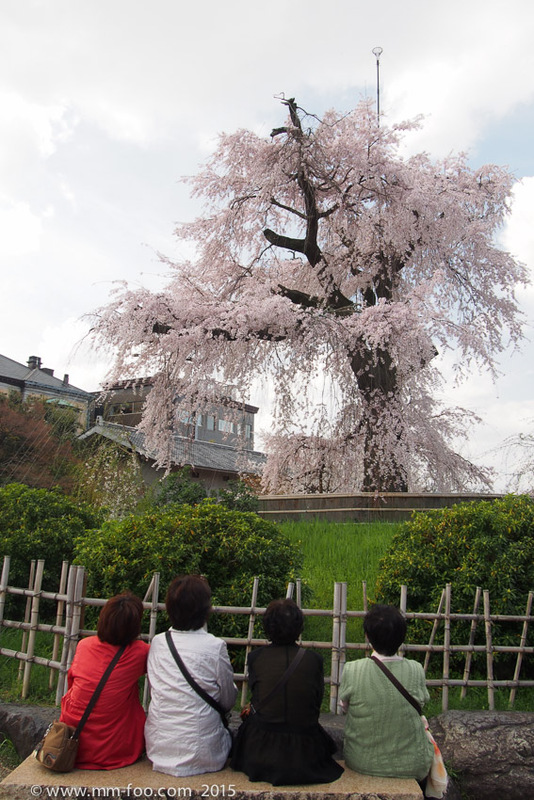 We decided that I should try to catch a falling sakura flower. Woop! Caught it! It's the first photo from the above series. 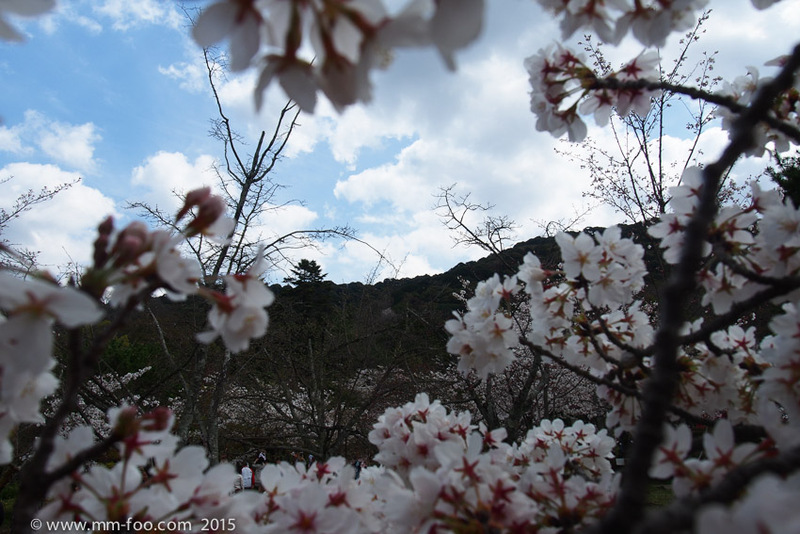 Then MF proceeded to take more photos of the lone sakura and surroundings. Wouldn't it be lovely living in this house and seeing sakura outside your window? A couple dressed in kimono that MF asked to take a picture of. Unfortunately we didn't do any of the dressing up and walking around Kyoto in kimono because of our limited time and also because we had the bikes. We then headed off to lunch at the tofu place! It was awesome and you should go try it out if ever you're in Kyoto! 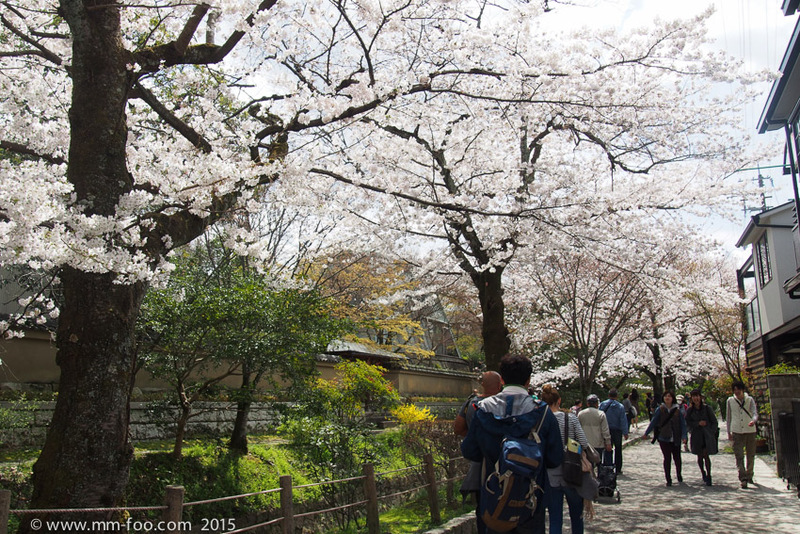 It's pretty much opposite Kitano-tenmangu shrine (photo below). We went into the shrine after lunch and had a quick walk around. It wasn't super interesting and I was tired after all the cycling and eating so I had a nap. Since it was getting late and we had a dinner reservation at Kichi Kichi, we decided to head back towards the city centre and passed by what looks like a Town Hall. After dinner we went to Nishiki market to check it out. Most of the food stalls were closing/closed so we just wandered around for a bit before calling it a day. We went back again the next morning when everything was open. Man selling roasted chestnuts. We tried one.. it was quite yummy! Man making what looked like toasted senbei with beans. Everything is freshly made and then packed in small packets to be sold! Craftsman carving on a knife. We stopped by one of the knife shops to drool over the amazing variety of knives that were there (and lamenting on how we can't afford them). So many pretty knives!!!!!!! And they're so sharp!!!! I couldn't believe that one wasabi root costs 1000 yen!! Oh and the strawberries were super expensive! 3000 yen for a pack of 6 strawberries!!??? I know they're massive but still!!! If anyone wants to buy them for me though... you are more than welcome. We forgot to take a photo of the tofu place so we cycled back to it. I didn't know that it was going to be closed so we were super lucky to have eaten the day before!! Our next stop was Kinkakuji. And this is the first appearance of Tora and Snakey. We actually just bought them in Nishiki market that day. One of my friends had said it would be cute if we had some figurines representing us in our travel pictures sort of like the lego man pictures. I was initially trying to look for boy/girl mini dolls but then we came across these animal figurines that are meant to represent the Chinese horoscopes. The figurines are actually meant to be chopstick holders but they served us well for this purpose! Glimpses of what a typical Japanese town looks like with a river and pathways on both sides. It seems very anime/Jdrama. Also found a cute flower shop along the way. I feel this picture with the train and the crossing is very typical Japanese. It's a scene that's very common and yet, I find it fascinating. Sneaking a picture of the girl in her kimono.. oh hello MF!!! We stopped by this pottery shop that's near our hostel to check out their wares. A lot of the stuff displayed outside was reduced so it was very tempting. We ended up getting quite a few bits and pieces from the shop. The lady packed it all up very nicely but unfortunately did not ship overseas. Not sure if she shipped locally. We had to carry the crockery with us all the way back to Osaka and bring it to a post office so that we could send it off. And lastly, here's a photo of the front of the hostel. This was our second stay with them because we also went here in 2012. Our original plan was to get a place via airbnb but unfortunately nothing came up for us in Kyoto and I don't think I could find anything much cheaper than Peace House. No complaints about this place, it's clean and they rent their bikes out quite cheaply. Win!